Nothing was safe from the Nazis' attempt to infiltrate every corner of German life - right down to how people celebrated Christmas. Later, the crowd sang holiday carols and nationalist hymns around a Christmas tree. Working-class attendees received charitable gifts. But under any totalitarian regime, there can be a wide disparity between public and private life, between the rituals of the city square and those of the home. In my research, I was interested in how Nazi symbols and rituals penetrated private, family festivities – away from the gaze of party leaders. While some Germans did resist the heavy-handed, politicized appropriation of Germany's favorite holiday, many actually embraced a Nazified holiday that evoked the family's place in the “racial state,” free of Jews and other outsiders. One of the most striking features of private celebration in the Nazi period was the redefinition of Christmas as a neo-pagan, Nordic celebration. 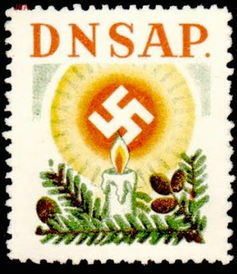 Rather on focus on the holiday's religious origins, the Nazi version celebrated the supposed heritage of the Aryan race, the label Nazis gave to “racially acceptable” members of the German racial state. First, because Nazi ideologues saw organized religion as an enemy of the totalitarian state, propagandists sought to deemphasize – or eliminate altogether – the Christian aspects of the holiday. Official celebrations might mention a supreme being, but they more prominently featured solstice and “light” rituals that supposedly captured the holiday's pagan origins. It's a small, almost banal example. But it speaks volumes. In Nazi Germany, even shopping for a gift could naturalize anti-Semitism and reinforce the “social death” of Jews in the Third Reich. Propagandists proclaimed that as “priestess” and “protector of house and hearth,” the German mother could use Christmas to “bring the spirit of the German home back to life.” The holiday issues of women's magazines, Nazified Christmas books and Nazi carols tinged conventional family customs with the ideology of the regime. Propagandists tirelessly promoted numerous Nazified Christmas songs, which replaced Christian themes with the regime's racial ideologies. 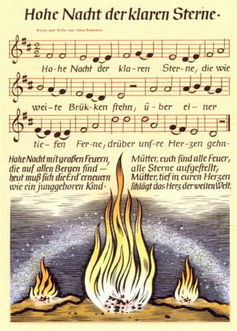 Exalted Night of the Clear Stars, the most famous Nazi carol, was reprinted in Nazi songbooks, broadcast in radio programs, performed at countless public celebrations – and sung at home. While the song's melody mimics a traditional carol, the lyrics deny the Christian origins of the holiday. Verses of stars, light and an eternal mother suggest a world redeemed through faith in National Socialism – not Jesus.